The need for well trained veterinarians in the area of food supply veterinary medicine is critical at the local, state and national level. To encourage the development of students capable of providing professional service to the area of food animal medicine, a Certificate in Food Animal Veterinary Medicine (FAVM) is offered. The program is administered by the Food Animal Reproduction and Medicine Service in the Department of Large Animal Clinical Sciences. Students participating in the certificate program are mentored through didactic, clinical and extracurricular activities that provide a strong entry level training in food supply veterinary medicine. Students from all backgrounds and experience levels are encouraged to participate. This is an opportunity for students to fill in experiential deficits and provide early curricular exposure to FAVM. Students with rural backgrounds that have had experience with food producing animals are particularly encouraged to participate. Students who successfully complete this program will receive a certificate that documents their directed training in FAVM. The certificate will identify the new graduate veterinarian as capable and ready for an entry level position in a food animal practice or a food systems profession. The certificate will provide students an edge in employment readiness as a result of their dedication, work ethic and commitment to the certification process. They will be better prepared to provide leadership in the area of food systems veterinary medicine. This process will also prepare the way for specialty training in an internship and(or) residency program and (or) advanced training in a graduate education (MS, PhD) program. Faculty mentors will play an important role in helping students clarify and pursue their career goals and set the path for their completion of certificate requirements. Extracurricular experiences provide early exposure to FAVM. This is accomplished primarily by participation in the Food Animal Club within the College. Students participate in and provide a leadership role to this student organization. Weekend and evening wet labs coordinated by the student club and the faculty mentors provide hands-on animal experience, discussion of food animal topics and, very importantly, contact with others of similar interest, i.e., students, food animal residents, interns and faculty. Students become members of one or more of the food animal professional associations, i.e., the American Association of Bovine Practitioners (AABP), the Society for Theriogenology (SFT), or Academy of Veterinary Consultants (ACV). These associations strongly encourage student development within their respective professional organizations. Observe the benefits of a career in FAVM, specifically, the role in providing for the safe, wholesome production of animal source food and the care of those animals. Observe how their veterinary medical knowledge can be applied to the benefit of a well-educated clientele, their population of animals and to the benefit of the consuming public. Participate in seminars, tutorials, and experiences that will support the new graduate veterinarian in preparation to function in and (or) establish a food animal practice. Be educated in the proper handling of and work with large animals to overcome concerns about the physical aspects of a career in FAVM. Weekend wet labs are organized through the fall and spring of the each year in cooperation with the Food Animal Club and its faculty coordinator. Wet lab instruction is generally provided by food animal house officers and faculty mentors. The labs provide instruction in bovine palpation, toxic plants, small ruminants, necropsy/pathology, dehorning, nutrition, ultrasound utilization, embryo transfer, foot care, nursery pig care, breeding soundness evaluation of the bull, artificial insemination collection center (tour), grazing dairies, euthanasia, and other timely topics. Students receiving ‘certificate’ credit for participation in wet labs are expected to earn 2 credits during the 4 years of professional training. Attendance at 8 labs is equal to 0.5 credit. It is suggested that those participating in the certificate program earn one certificate credit in their first year and the remaining credit over the next 3 years, including a half credit (8 labs) in their 4th year. An important part of a student’s academic and scientific development is the curiosity and critical evaluation associated with pondering a research question and developing and executing a research study. Students will carry out an individual investigation under the supervision of a food animal clinician or an approved scientific mentor. The role of the mentor is crucial in helping to identify and develop a project that will help the student develop analytical skills and reach professional goals. The research will be conducted with a focus on addressing a food supply veterinary medicine question/problem. The study will be hypothesis driven, with specific objectives defined and evaluated. At the study’s conclusion, the findings will be presented in an appropriate forum, i.e., Phi Zeta Research Emphasis Day, AABP or SFT student presentations, and publication of results is encouraged. As students prepare to enter clinics, they will select a Food Animal/Large Animal/Mixed Animal track emphasis. 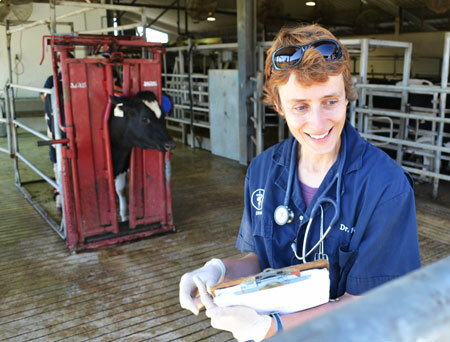 As a result, their clinical assignments will permit early participation in the food animal clinical rotation and subsequent elective rotations. Further, students will be readied early in clinical experience to participate in externships and receive external mentoring at locations that will provide strong and supportive opportunities under the guidance of practitioners and their faculty mentors. Upon return from each of at least 2 externships, the student will prepare a written report of the experience. Students will be given an appropriate forum to share their experiences in presentation format with other students. Note: Please see the Student Handbook for detailed course descriptions. The find feature (Ctrl-F) is extremely helpful. Be enrolled as a DVM student and in good academic and professional standing. Maintain good academic standing. [If a student is placed on academic probation, his or her ability to participate in this program will be interrupted until academic probation is resolved in a satisfactory manner]. Complete 16 credit hours of approved, elective food animal academic course work. Select a food animal/large animal track emphasis for clinical and didactic course work (a mixed animal track may be selected in approved cases). Identify a faculty mentor who will provide guidance through the elective course work, individual investigation and externships. Oversight of academic credits earned by student participants will be administered by the Associate Dean for Academic & Student Affairs. The tracking of Certificate program elements and student progress therein will be supervised and administered by the Food Animal Reproduction and Medicine Service (i.e., the service chief and faculty mentors). The certificate will be awarded at the time the DVM degree is awarded. For further information, contact the Food Animal Reproduction and Medicine Service at 352-294-4313.